Fughu is an Argentine quintet Buenos Aires released their second album, a double concept, after receiving praise from the international press with Absence its first efforts went unnoticed at home. 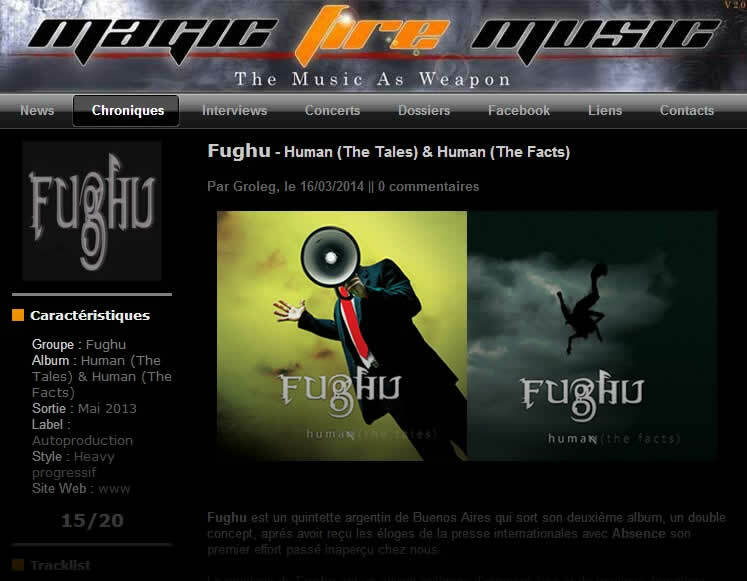 ‘s music Fughu is a mix of atmospheres and energetic music driven by a powerful and beautiful voice, that of maestro Santiago Bürgi , so Geoff Tate in the most serious voice. Music combo is very focused on riffs, often abrasive, forged byAriel Bellizio. “The Human Way” is a glaring example and begins the most beautiful ways this “Human” , subtitled “The Tales” . atmospheres The group develops the image of Pain Of Salvation , a very marked influence on the background keyboards Marillion , developing a dramatic pomposity that might evoke at times Savior Machine . This is demonstrated “Inertia” whirlwind currents. The song also reminds me of many great Eric Clayton, you know, between power, drama and lyricism. “Dry Fountain” , a kind of ballad, figure all the delicacy would have been able to give him Pain Of Salvation. JM Lopez infuses a groove in low worrying “Twisted Mind” in the atmosphere very cold and tortured. Those who liked the heyday of Westfall should find their account. This is what emerges from this first part entitled Human (The Tales). Human (The Facts) starts with“The Void” about the “revolutionary” in its implementation. The title is clearly progressive akin to early Landmarq. In the same vein, “Quirk Of Fate” features a deep offset by its keyboards to Tangent . It should be noted, moreover, that Damian Wilson made ​​an appearance on this title where Santiago takes for vindictive Fish of early Marillion. This very gradual as the presence of Damian undoubtedly evokes Landmarq Mark I . Conversely, “Climb” is a very air as well as in the construction in the melody on keyboards. Santiago y features an emotional song. Superb. “Vater” and bombastic song can be found clearly Rammsteinienne earth. This is why we can say that The Facts is a roller coaster because from “Winter” , Fughu returns felted with this title that focuses on smoothly. Fughu with Human emotion clearly speak through a remarkable song that transcends this progressive heavy inventive.